This somewhat scary image isn't a photoshop job, although some people wondered about it. Novomyshastovskaya village, a local park, where holidays and memorable dates are celebrated. There is a monument to the mothers of the war, the defenders of the Fatherland, and the unknown soldier. And only by the characteristic gesture of this figure you can recognize the leader of the proletariat. The gesture, one with unnaturally twisted swollen hand. Without finger. The mustache and the beard vanished . The chin totally resembles a Neanderthal. And there is no text on the pedestal - whose monument it is? First, the pictures that appeared on the Internet, were called a fake. The very figure itself was called a monument of Neanderthal, Schwarzenegger, and even Botox Injections. 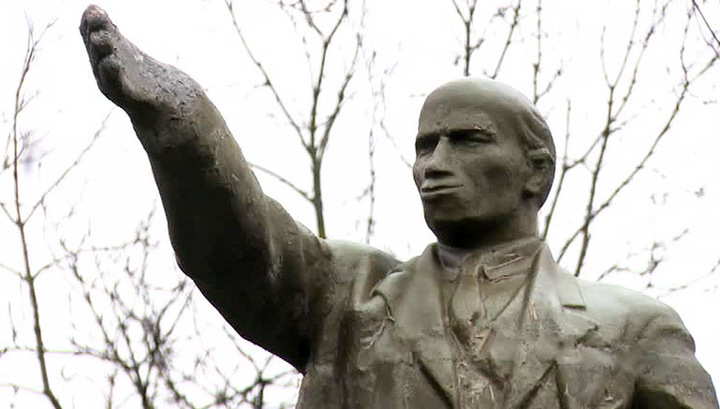 Lenin has got a new face and a hand long ago. The name of the person who has performed the restoration, was lost - everything was done on a voluntary basis, without contracts. The face of the monument began to crumble 6 years ago. It was removed from the balance of the local collective farm, and no one was monitoring its well being. The monument is still abandoned. The activists couldn't collect enough money for proper restoration. But the monument became so famous that local authorities promise to find an investor and to return to the monument its original face. (*) Don't blame me. Both Google Translate and I came to the same result.